A microscope creates a circular image, as seen through the eyepieces. Microscope digital cameras have a sensor that creates a rectangular shaped imaged. When connecting a microscope camera to the microscope, a c-mount adapter is used. C-Mount adapters are available with different magnifications (1x, 0.65x, 0.5x, 0.35x) and pairing these de-magnifying adapters with camera image sensor sizes (1/3", 1/2", 1" chip size) all while trying to maximize field of view can be confusing. Let us start by looking at the microscope c-mount adapter. Each microscope c-mount adapter is made specifically for a brand and type of microscope. Microscope c-mounts should not be interchanged from one microscope to another. The bottom part of the c-mount adapter is made to fit the microscope trinocular port. For example a Zeiss Stemi 508 microscope c-mount adapter could not be used on a Richter Optica microscope and vice versa. These microscopes have completely different trinocular ports and focal lengths, each requiring their own specific c-mount adapter. You may notice a number on the side of the c-mount (1x, 0.65x, 0.5x, 0.35x, etc.). This number refers to the de-magnifying lens built into the c-mount adapter. This lens, when paired correctly with the size of camera sensor (2/3", 1/2", 1", etc.) 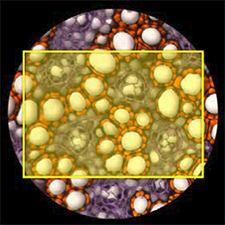 will allow the image seen through the eyepieces to match as close as possible to the image seen in the camera. In other words, it will maximize your field of view. Camera sensors provide added magnification that is not always desired when looking through the microscope, and this is why c-mount adapters have de-magnifying lenses built into them. There is an article that discusses proper pairing of image sensors and c-mount adapters in depth here. Some c-mount adapters will have a focusing adjustment on the side, such as the c-mounts shown above. This allows you to parfocal the microscope eyepieces with the camera so that both are in focus at the same time. Finally, all c-mount adapters have a universal 1" thread on the top of them with 1/32" pitch. 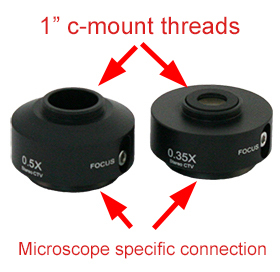 This 1" thread allows connection of any c-mount microscope camera directly to the adapter. A 1x c-mount adapter has no lens in it. It is basically a device for positioning the camera sensor directly on top of the image. Unless you were using a camera with a very large camera sensor, using this c-mount adapter would result in the image shown at left, giving the camera about 10% field of view from what you are seeing through the microscope eyepieces. Most people would agree that this image is not desirable when putting a camera on the microscope. When a c-mount camera adapter has a de-magnifying lens in it (basically any c-mount adapter other than a 1x c-mount), the adapter compresses the intermediate image and increases the captured image seen at the camera. The image at right was captured using a 0.65x c-mount adapter, resulting in a 23% field of view from what you see through the microscope eyepieces. This is definitely progress from what we saw using the 1x adapter. But we can still probably do a bit better. Next we have an image captured using a 0.5x c-mount adapter. 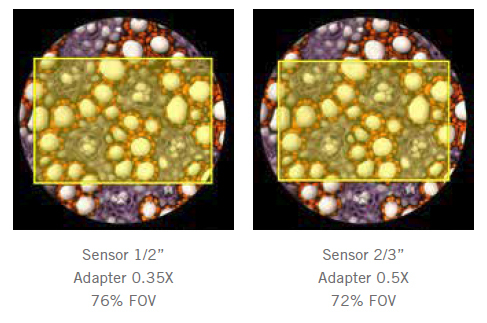 This adapter provides 38% field of view from what is seen through the microscope eyepieces. Now we are getting somewhere! At some point when moving down in c-mount adapters, the field of view will actually overlap the edges of the circular microscope image and result in vignetting (when you can see a dark circle outside the edges of the image). When we move to the 0.35x c-mount adapter (shown at right), you can see that in the very edges of the rectangular image we are starting to get some vignetting and going outside the circular image. However, the 76% field of view might be worth this small bit of vignetting. The goal when choosing a c-mount adapter is typically to maximize field of view as seen through the camera. The image below shows this maximization using two different cameras and two different c-mount adapters. The image on the left had a 1/2" camera sensor that was paired best with a 0.35x c-mount adapter. This provided 76% field of view. The image on the right shows a camera that had a 2/3" sensor paired with a 0.5x c-mount adapter, resulting in a 72% field of view. 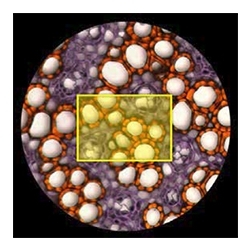 The images above show the goal of any pairing between a microscope camera and a c-mount adapter: to maximize the field of view. If you have questions about c-mount adapters or getting maximum field of view from your camera and c-mount combination, contact Microscope World and we will be happy to help. Thank you to Motic microscopes for providing image sensor images.